The Missouri River Power Co. energized a 65-mile line from Canyon Ferry to Butte at 57kV. 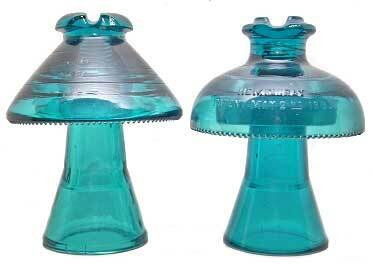 Like the Telluride Co. before it, the engineers at Missouri River Power believed in glass insulators and designed them specifically for the new line. The first was the CD303/310 “Muncie,” which had a tendency to break off at the neck. A stronger design, the CD304 “Coolie Hat,” was used later. Both types have given good service until recently. The poles were built with all-wood construction. 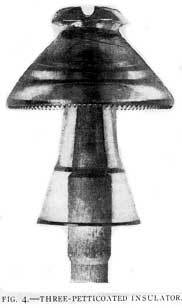 Pins were boiled in paraffin, and were considered to be part of the insulation. The power plant used a glass-and-wood station post (shown at left) in “Cochrane Bell” style but larger (7 in. diameter).